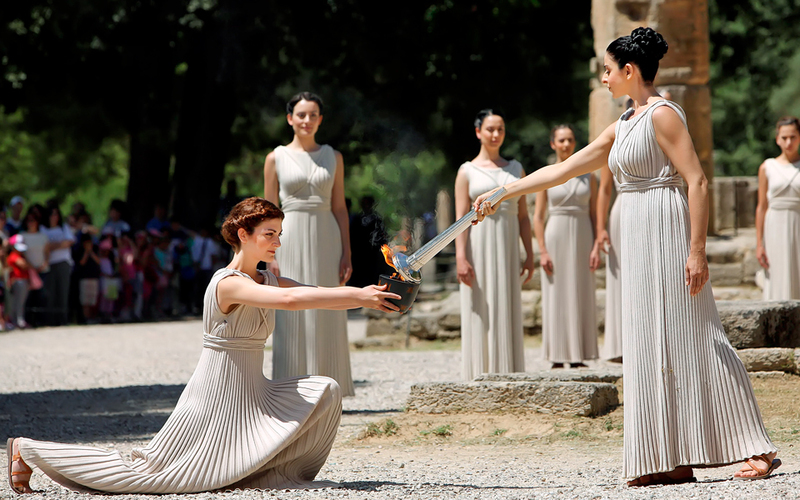 The Rio 206 Olympic flame will be lit in one month’s time on April 21, 2016, at the site of Ancient Olympia. The ceremony, which first took place in 1936, involves performers in the roles of ancient priestesses lighting the torch at the Temple of Hera (Heraion) at the archaeological site of Olympia. There, the performer in the role of the High Priestess calls on the god of the sun, Apollo, to light the torch and offers a prayer. The torch is lit by means of a concave mirror which concentrates the sun’s rays to light the torch. The process is the responsibility of the Hellenic Olympic Committee (HOC). Once lit, the torch will be handed over to the Rio 2016 organizing committee at the Panathenaic Stadium on Wednesday, April 27, 2016 after a tour of Greece. As is the tradition, the torch will then go on a relay tour, traversing across Brazil before arriving at the stadium for the opening ceremony of the 2016 Olympic Games on August 5, 2016 at Maracanã Stadium, Rio de Janeiro. The Olympic flame will visit 83 cities, including 26 state capitals, and will pass through around 500 towns, with 300 hosting the relay and another 200 watching the convoy go by. An estimated 90 percent of Brazil’s population will be reached via the relay, covering 20,000 km by road and 16,000 km by air. In acknowledgement of the refugee crisis, during the Greek relay the Olympic flame will pass through the Elaionas refugee reception center in Athens, with a refugee symbolically carrying the flame as a torchbearer. The idea was presented to the International Olympic Committee (IOC) by the Hellenic Olympic Committee’s president, Spyros Capralos. “In addition, a refugee will carry the flame as a torchbearer, totally in line with the policy followed by the IOC with regard to the refugees and the Olympic Games,” Bach said, explaining that the refugees will be welcomed into the Olympic fold. “Having no national team to belong to, having no flag to march behind, having no national anthem to be played, these refugee athletes will be welcomed to the Olympic Games with the Olympic flag and with the Olympic anthem.